Take on a new challenge at the NEW Zoo Adventure Park for an exhilarating, fun, and safe experience! The NEW Zoo Adventure Park offers a variety of challenge levels, allowing guests of all ages to choose their challenge level. There are three parts to the Adventure Park. Zip lining is a thrilling experience for the whole family. Starting from 50ft in the air, participants are strapped in and sent zip lining 1000ft at speeds up to 40mph! This experience is also available for those with limited mobility, as it is equipped with a hoist. Anyone 8 years old, or older is welcome! 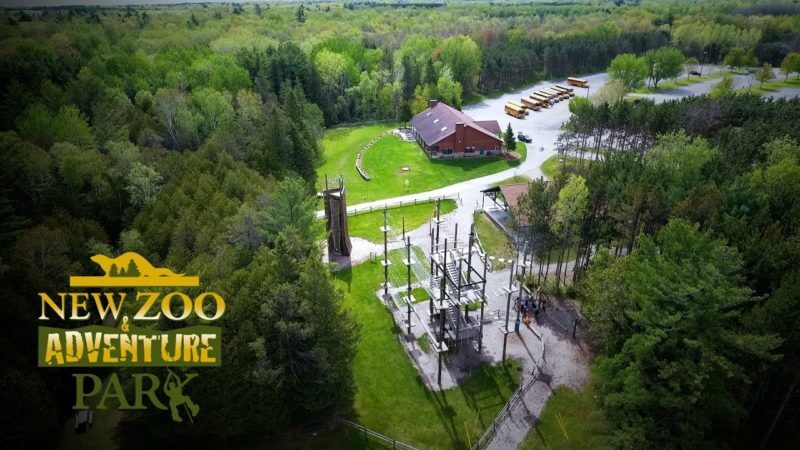 The Aerial Adventure Course is not for the faint of heart. Offer three different levels of challenge, this course is situated high up in the air! A short orientation is necessary to be on the course and some restrictions apply. A three-sided Climbing Tower is the last challenge you can partake in. The tower has two contoured climbing walls and one cargo net, all of which extend 40ft into the air. There are hundreds of paths to the top, of varying difficulty, so choose wisely and be the first to reach the top! After enjoying the Adventure Park, stop in at the NEW Zoo to see all of the animals!